Advancements in technology have provided man a significant competitive advantage in the field. Long gone are the days of Prince Luigi Amedeo, who in 1909 led an expedition to climb K2 in Karakorum with wood handled tools and woolen suits. Or John Jeremiah Garrison Johnston who famously survived a wintery escape by feeding on a limb of one of his captors. 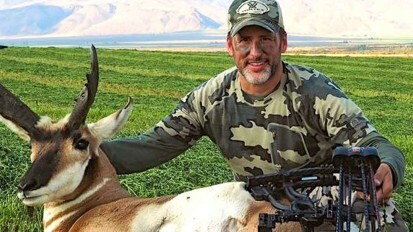 At Horse Creek Outfitters we look to level the playing field, to take a step back in time and to take the emphasis off of technology and to put that emphasis back on our skill, physical fitness, survival techniques and mental fortitude. ATV’s, UTV’s, dirt bikes, long range shots and complaining are not part of our core philosophy. HcO seeks hunters who want to share a complete physical and mental challenge. We do not babysit. We do not coddle. Every year we look to reduce our reliance on stock and the amenities that define our daily lives in civilization. We are looking for hunters who will sacrifice comfort in the name of adventure. 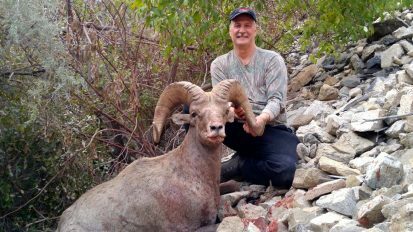 Self sustained, off the back, backcountry hunts…the ultimate western hunting challenge. That is what we love. At the end of a successful hunt all involved will be proud of what they have accomplished and the memories will be branded in our minds for eternity. We pride ourselves on our fair chase tactics and our ability to harvest game in their natural habitat. 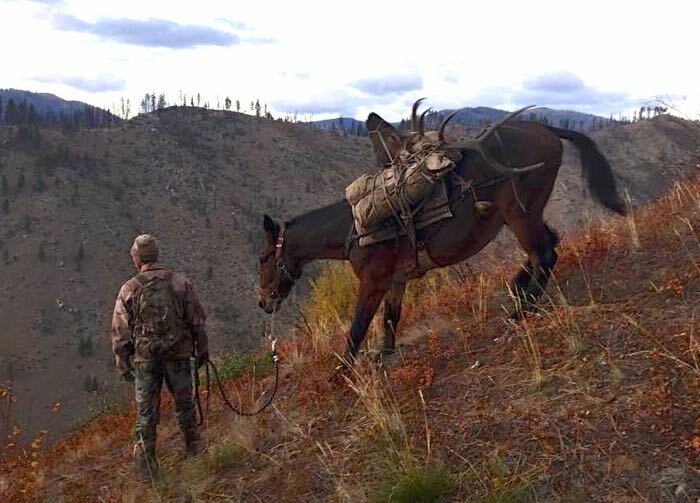 Horse Creek Outfitters will take you on the ultimate Idaho adventure using traditional methods in some of the most pristine, abundant and diverse wilderness this planet has to offer. We work hard, hunt hard and produce results ethically. Visitors can expect sweat, maybe a little blood, and tears of euphoria following a sensational outdoor experience. 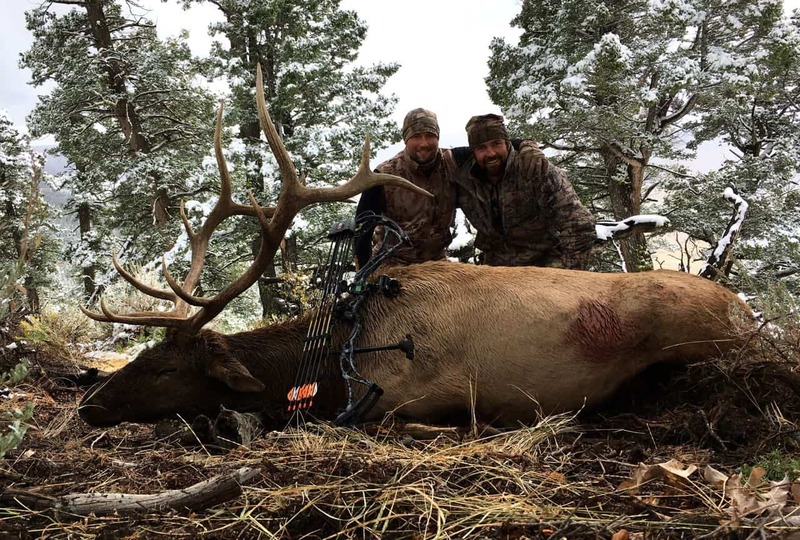 Clients will be accompanied by the best guides in the business, professionals whom prioritize safety, experience, success and share the HCO vision and approach to the outdoors. Join us. Your adventure awaits in Idaho. He came charging in bugling and sent a shiver down my spine. He was heading directly at Adam and wasn’t stopping so I buried my 40 yd pin and let the arrow fly. I hit a little high and back but hoped I had caught lung. We waited……. 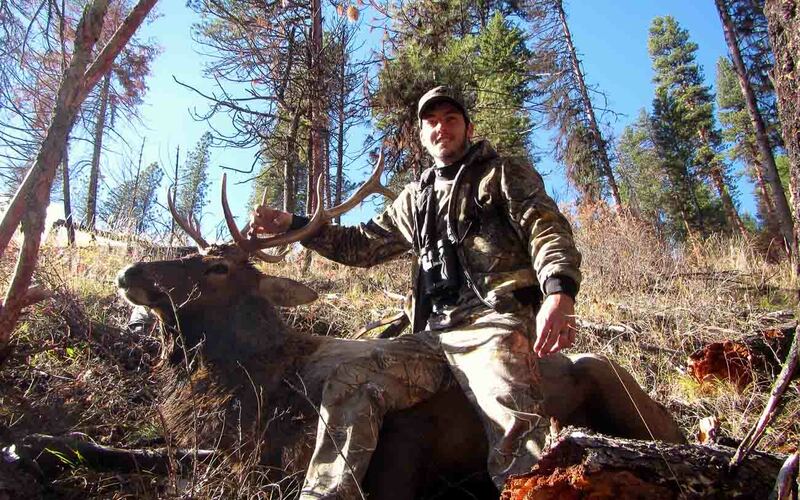 then started tracking and 150 yds later, I laid my hands on a public land Idaho Bull Elk. This has been the most physically and mentally challenging hunt I have ever experienced. The terrain is beautiful yet unforgiving. The weather is completely unpredictable and at times harsh. We walked miles in cold, wet, and sometimes completely frozen boots at elevations ranging from 6500 ft to 9500 ft. At times my mind & body told me to give up but my heart wouldn’t let me. I kept hiking, kept believing, and kept hunting. In the end, I have experienced an adventure that I will remember forever. The days spent in the Idaho mountains are a constant learning experience that I will cherish forever. My brother and I are just heading home from an amazing hunt with Horse Creek Outfitters. Tired and sore from an aggressive hard hunt. Don and Adam had worked hard and had us into elk the whole time. Weather was odd. Rainy and foggy day 1 and and the rest of the time it was unusually warm and sunny for late October. Oct 21st and the bulls were still bugling! Stalked into a large herd and pulled out the herd bull and a 5 point. 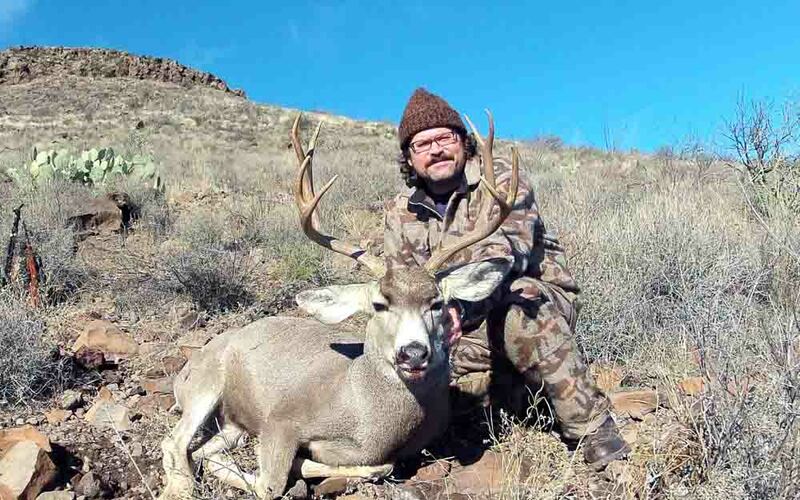 We set up a spike camp on the ridge that night before the pack out and the next morning over a mountain house breakfast Adam spotted a good mule deer and he and my brother snuck in and got him. Also thanks to all the hard work from Dalton and Megan. The amount of work you guys put into your job is incredible! We will be back! I better start training now. Adam Beaupre and Tom Martiny are consummate professionals. It seems that wherever they are, they know what game is afoot, where they are, and what they are doing. 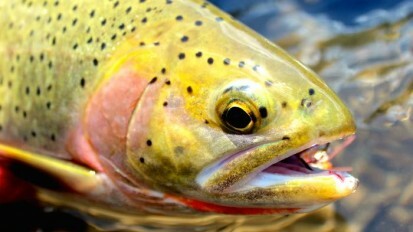 Add to that professionalism an easygoing personality of a good friend and you have the makings of a fine hunt indeed. 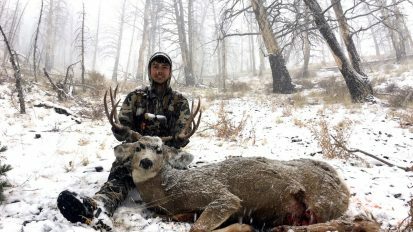 We have hunted together in several states for several different species, and I look no further for a guide and hunting buddy. We had a blast, accommodations were outstanding. 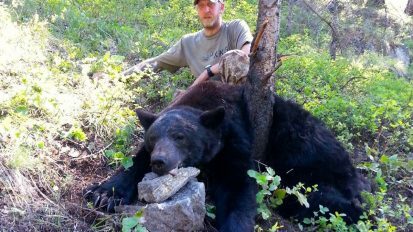 We would definitely recommend Adam and his staff as a first class professional organization, in fact we hope to hunt with them again. 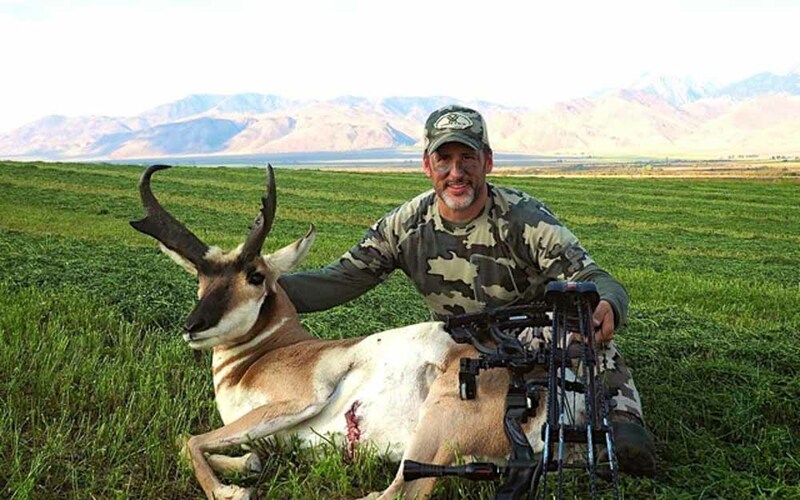 Adam is a great guide and very knowledgeable (great at calling Elk even after the Rut), he knows what he’s doing and works very hard to give you an opportunity tailored to your physical abilities. 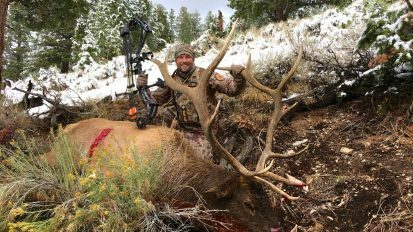 Chase the dream with Horse Creek Outfitters as we update you on the amazing stories that weave themselves together in the Idaho backcountry. Sit back and Drink. It. Up.